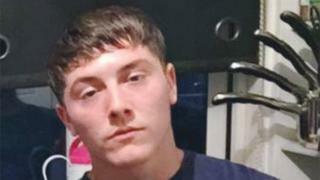 The 22-year-old, named locally as Reece Hillier, ran off after being detained by officers in Southampton. Police launched a manhunt but found no trace of him - until a body was discovered by magnet fishermen in the River Itchen at Woodmill on Sunday. The Independent Office for Police Conduct has agreed the death should be investigated by Hampshire Constabulary. It is not known whether the man entered the water by accident or in an attempt to evade the police. His girlfriend, Brittany Bellows, said he was "always singing and dancing and filling the room with laughter and joy". Floral tributes and balloons have been left at the scene. The death is not being treated as suspicious, police said. "Identification has now taken place and we can confirm that the body is of a 22-year-old man from Southampton," a spokesman said. "Initial inquiries suggest the body had been in the water for some time."